"Being a livestream he acts as 'eyes and ears' for the viewers. Literally. People will tell him to move the camera somewhere and he'll do it. They'll ask for interviews with someone, and Tim will go over and do so... The viewers will ask him questions and he won't rest until he gets them their answers." Recently, Alexis Madrigal, the technology editor of The Atlantic and pretty much the smartest young journalist ’round these parts, re-described occupy Wall Street as an API, or Application Programming Interface. API is an acronym for Application Programming Interface. APIs allow data to be pulled from an online source in a structured way. So, Twitter has an API that lets app developers create software that can display your Twitter feed in ways that the company itself did not develop. Developers make a call to that API to “GET statuses/home timeline” and Twitter sends back “the 20 most recent statuses” for a user. GET Decentralized leadership structure: Repeat mantra that the movement is ‘leaderless.’ In practice, have no single leader on whom the media and/or public can focus. Avoid profiles of organizers…. That’s all background to this letter I got. It’s a perfect example of… “Anyone who wants to support Occupy Wall Street can just do something.” The letter tells of an adventure in citizen journalism unfolding around Occupy Wall Street. Chris Fornof explains it as well as I could, so I am going to shut up and let you listen to him. This is Chris Fornof. You likely don’t remember me, but I was involved briefly with Assignment Zero. I’m a huge supporter of citizen journalism and try to help out in little ways where I can. I’ve been glued to media coverage of #Occupy, and I saw something this week that I thought you’d be interested in. Basically he’s a protester-turned-reporter with a cell phone who is doing some very uniquely awesome things with his streaming ustream coverage. He’s been doing 20-hour live reporting marathons, but what’s extremely powerful is the feedback loop that he has with his viewers (numbering in the 15k+ live, 100k+ daily). There’s a unique symbiosis happening. Being a livestream he acts as “eyes and ears” for the viewers. Literally. People will tell him to move the camera somewhere and he’ll do it. They’ll ask for interviews with someone, and Tim will go over and do so (taking extensive feedback, questions, and commentary from the channel viewers). The viewers will ask him questions and he won’t rest until he gets them their answers. There is no delay or time to press. It’s instant. And it’s awesome. When his camera battery goes low, people swarm into action. Purchasing batteries, locating someone on the ground to deliver, and coordinating delivery. He’s got a dozen batteries, pack and chargers just donated to him so he can keep recording. He mentions he’s getting hungry and somehow people make sure he’s fed with a constant stream of random strangers exactly what he needs when he needs it. This also extends to a few thousand people that will devour twitter and live news feeds to give him active intel so he can stay safe. The goodwill he’s engendering is ridiculous. Beyond the participation, there’s relationships happening here. I have never seen this kind of support for a journalist before. He logs off for the night and hundreds of people stream in their “THANK YOU!”s and undying gratitude. He’s got some TIME people following him for the past few days. I expect you’ll hear more about him soon. (Link.) I strongly feel that the kind of reporting he’s doing represents the future of what citizen journalism could be. There have been a few dozen livestreams of the protests that have been fascinating to watch, but Pool has been one of the first to engage viewers like this. I was hoping sometime that you may be able to get in touch with him. Perhaps advise him. You are well connected in the field of journalism and can likely appreciate the uniqueness of what is happening here. From watching his interactions, Tim seems very level-headed and could likely serve as a good case-study for citizen journalism in action. Who knows? Thank you for your tireless support for citizen journalism over the years. It’s a long-haul trip but I think the world is finally waking up to the things you’ve been saying. Keep up the great work! Occupy PressThink (see how well that API works?…) has a few comments about this. Tim Pool is a perfect example. In fact, I can’t think of a better illustration of what I was trying to get across in sculpting that definition. 2. It’s hard to overlook the fact that his name is Pool. In pressland, a “pool” report is what happens when the entire press corps can’t have access to a news event, so a representative team of 3-4 reporters is sent and their accounts are then shared with the whole gang. They have to be the eyes and ears for others. They have to ask what others would ask. They can’t keep what they find out to themselves. In a way, that’s what Tim Pool does. Yes. And one of the things we need to experiment with is the relationship (sorry, can’t think of a better word) between journalists and the people who depend on them for reports. “When his camera battery goes low, people swarm into action…” is just that: an experiment in what this relationship could be like: We’ll help you, we’ll feed you, just keep the reports coming. I wrote about an earlier example of this kind of relationship here: They’re Not in Your Club but They Are in Your League: Firedoglake at the Libby Trial (2007.) As Shirky says, we need more experiments in how the (dependent) users can support the (independent) reporters. 4. From Wikipedia: Pool broadcasts using his 4G Samsung Galaxy SII. See this report on Pool for more on his tech. 5. This might be a good time to mention that Tim Pool is clearly an activist and supporter of Occupy Wall Street as well as a reporter of it. If you believe those things can’t possibly go together, fine, I know where you’re coming from. But don’t expect me to freak out or even care that you wouldn’t call Pool a journalist. As I’ve said before, we should focus less on “who’s a journalist” and more on valid acts of journalism. When we can recognize the act, the “who” becomes easier: anyone committing the act! 6. When young people ask me what they should do if they want to become a journalist, here is what I normally tell them: the most important thing is not to go to J-school, or start a blog, or get a newspaper to hire you (though all those things are good!) but to get yourself into a “journalistic situation.” A journalistic situation is when a live community is depending on you for regular reports about some unfolding thing that clearly matters to them. If you really want to be a journalist the best experience you can have is to be depended on by people who need you as their eyes and ears, their interviewer, their man or woman in the field. Tim Pool: he’s in a journalistic situation, classically so. And I bet he’s learning a lot from it. See also my Tumblr post: Tim Pool, the man behind @TheOther99, is bringing the Max Headroom prophecy to life. GigaOm: Occupy my TV: The birth of the citizen video reporter. Follows up on this post with a trend story. 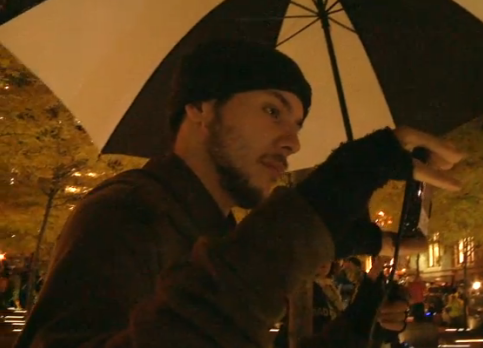 Fast Company: Tim Pool And Henry Ferry: The Men Behind Occupy Wall Street’s Live Stream. NPR’s On the Media: Q and A with Tim Pool. Mathew Ingram: What happens when journalism is everywhere? You can follow Tim Pool on Twitter and get word on when he’s live streaming that way. First: This is so exciting! Second: You may have already seen This, but, like you, I’m in love with the “OWS as API” metaphor. Brilliant. Third: I laughed out loud when I read this: “Occupy PressThink (see how well that API works?…)” Ha. Thanks for that. Fourth: Re: “One of the things we need to experiment with is the relationship (sorry, can’t think of a better word) between journalists and the people who depend on them for reports. ” Yes, yes, yes. Important. I think it’s important to understand not just the link between these entities, but the relationships (as in bonds, friendships, etc) that form between journalists and the participating audience (sorry, can’t think of a better phrase). To understand — and design for — the empathy that arrises between people watching Tim Pool report and Tim Pool. Or between Andy Carvin and the people who follow him on Twitter. (I’ve never met Carvin, but I trust him, like him, and feel like I know him — at least the quality of his character — through his Twitter feed. I support him and his efforts in a similar way that I might one of my own friends.) This notion of empathy is a Big Deal (capital B, capital D). A lot of people are thinking about relationships and technology. Check out Jerry Michalski’s on the relationship economy: https://twitter.com/jerrymichalski (His Twitter feed links to his blog). Just tonight, I blogged about a talk Jamais Cascio gave at Guardian Active 2010 on the future of the Internet being “the future of how we interact with each other. How we relate to each other.” And how we can design and create technologies that increase our amount of empathy for others. Juicy stuff. I can’t wait to see what we (collectively) figure out. I’m glad you highlighted the case of Tim Pool. During the Day of Action on the 17th, I was glued to my laptop watching his live stream all the way over in Germany. The future of journalism had arrived, I thought. But I noticed something that perhaps highlights a problem with this form of journalism. A couple times, Tim would hear some factoid about the situation and would repeat it for his 25k viewers. Naturally, there’s no fact-checking to be done. Indeed, with this sort of live reportage, facts are checked over time and corrections must be published. I suppose the same goes for all modern news where the publishing cycle is quick and vicious. but kudos to him for doing it like a proper journalist. But for countless people that rumor will live on as fact. Tim would often preface statements that he had not verified himself as exactly that, but over the span of 20-hour reports (!) sometimes that part slips. Does this suggest a problem with the live-streaming citizen journalist? Or is it a pattern that the people simply must deal with in an increasingly rushed age of journalism? I think Scott Kilpatrick makes a very good point in his email, however there’s another end of the spectrum that’s worth examining too. When protesters were waiting for hours outside Zuccotti Park on Tuesday for the judge to issue his decision (about whether or not they could return to the park with tents), Tim heard that the judge had ruled against the protesters before most people had. Despite the use of social media in the protest, news is still slow to reach everyone. So if you were watching the stream, you’d hear Tim talking to people and informing them of the situation. It was fascinating, and the result of Tim’s connection to his audience. Similarly, two hours earlier than the actual decision, rumors circulated that the judge had ruled in favor of the protests. Tim worked his connections to dispel the rumor and informed those he spoke with of its falsehood. It’s his hunch, a gut feeling – not backed up by hard data – but one that I think is worth considering. The API metaphor is apt. Memes & movements are inherently open, and OWS is a tipping point of mobile technology meets citizen journalism / participation. OWS reminds me very much of Anonymous. If you want to be a part of it, you already are. great topic – love the metaphor! Warren Ellis wrote a fantastic comic series called TRANSMETROPOLITAN that imagined a lot about the future, and one of those things was journalism. Primarily he did this via the main character, Spider Jerusalem, who owes a lot of his demeanor to Hunter S Thompson. I think of it when you comment on journalism being something that one does rather than is. Piggy backing on comments by Todd Olmstead and Scott Kirkpatrick, I’ll add that issues with fact checking and reporting inaccurate information are not situated solely in citizen journalism. Anyone remember all the inaccuracies reported on and spread by MSM about the number of cables Wikileaks had released? Some guy blogged all of the MSM press that repeated this falsehood, but I can’t find it right now (can anyone else track it down?). Very sloppy journalism because it was very easy to find out the correct number of cables. Possibly the pattern that infuriates me most about traditional media journalism is the retraction in fine print on the back page for a fact that was inaccurately reported on the front page the day before. Citizen journalists, like professional journalists, are going to make mistakes. The important question is whether they act with journalistic integrity and correct their mistakes and inaccuracies. Tim’s been doing an amazing job, especially for someone with little or no “real” journalistic experience. His counterpart on the west coast, Spencer “OakFoSho” Mills, has been covering Occupy Oakland in an almost identical way. In fact, I think Spencer started before Tim did. Both are great examples of what the vaunted “citizen journalist” can do. One observation: For much of these first few days of this raw streaming phenomenon, the narrative has been almost as much about the process of live stream reporting as it has about the events on the ground– a kind of extended “reporter’s notebook” coverage. Both Spencer and Tim have come up against logistical hurdles like battery power, where to get a charge, who has a cable for this phone, intermittent loss of signal on their phone, people calling their phone and knocking out the stream, and so on. Not to mention food, water and sleep, as these guys have streamed live sometimes for 16 hours straight or more. Then there’s the fascination with the number of viewers online, and frequent mentions of how many thousands or tens of thousands are watching right now on ustream/* or livestream/globalrevolution — or even those times when Time.com or Al Jazeera pick up the feed. As a geek myself, I’ve been enjoying all of the details. But I’m also looking forward to the time when the logistics become less of a heroic effort, and less romantic, and the reportage is more about the actualities. Once that happens, our fascination with the immediacy of access and insider’s view can hopefully give way to more of a thirst for the details underpinning the events on-scene… and a deeper understanding of the news that these great citizen journalists are bringing to us — along with the vital, constant presence of the video witness, multiplied by thousands around the world. That’s when the true power of the live stream will be felt. You’re right, Bob. That’s very typical of an early stage phenomenon like this. Usually it settles down and the stuff that is about the channel itself drifts into the background. This is one of the reasons the 1% are trying to cut off and occupy the internet with our government’s help. the corruption runs deep in America, and it won’t change until the truth is uncovered by folks like Pool. The fight to remain free is just beginning. This is all well and good from a civic-pride standpoint, but how does Tim Pool (or an army of Tim Pools) turn this kind of thing into an income stream? It’s all well and good that viewers will send donations of batteries, food, etc., etc., but how does it turn into something that he can pay the rent with over the long term?